Building a massive fanbase with an endless array of bite-sized bangers, Alamo Records signee Comethazine is one of rap’s brightest young stars. Touring downtown NYC in his new foreign, the St. Louis shares “DeMar DeRozan,” his latest video single, premiered by Complex. Paying tribute to the all-star San Antonio Spurs shooting guard, known for his dunks and his penchant for hitting difficult shots, “DeMar DeRozan” finds Comethazine forcefully attacking a minimalist piano-based beat, delivering outlandish boasts and cascading ad-libs. In the video, premiered by Complex, Comethazine shows off his all-white Beamer, complete with suicide doors, as he raps through the sunroof in his neon-green, skull-adorned hoodie and kicks it with fellow Alamo signee KrimeLife Ca$$. 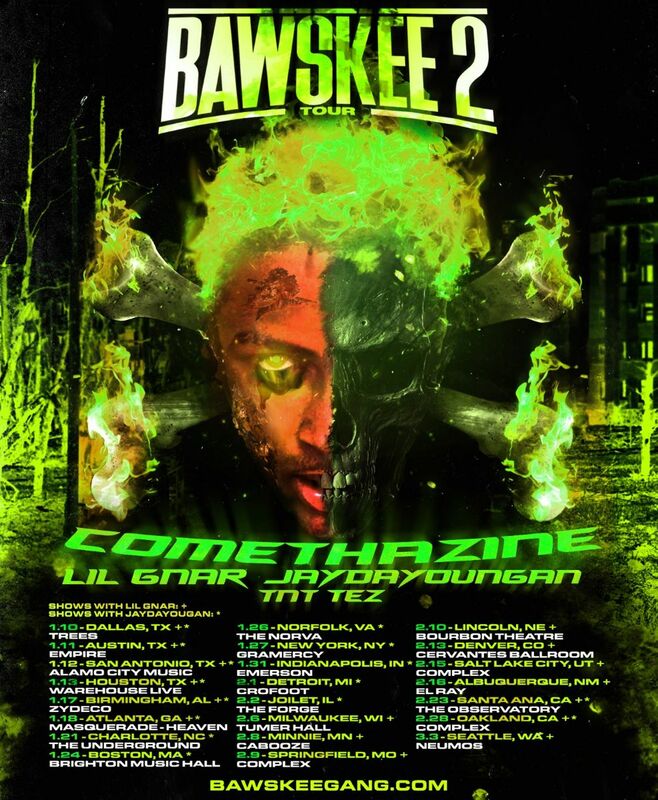 The lead single from Bawskee 2, Comethazine’s upcoming album, “DeMar DeRozan” arrives as he prepares his upcoming “Bawskee 2 Tour.” Kicking off on January 10th in Dallas and featuring support from Lil Gnar, JayDaYoungan, and TNT Tez, the “Bawskee 2 Tour” is a prime opportunity for fans to turn up to the tracks from the upcoming album and other singles like the recently released “High Riser,” which has over 1 million Spotify plays since its mid-November release. The follow-up to 2018’s highly successful Bawskee, home to Comethazine’s breakout single “Bands” (30.5 million Spotify streams, 19 million SoundCloud plays, 18 million YouTube views) and the rapidly rising radio single “Walk” (25.8 million Spotify streams), Bawskee 2 arrives on January 11th via Alamo/Interscope.